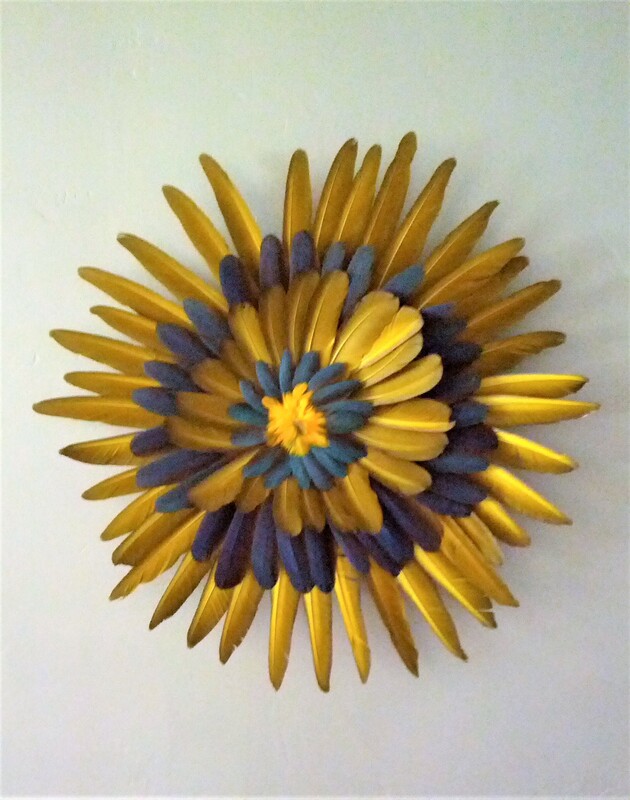 Summer is here and to celebrate its festiveness why not make a colorful feather wall art? Now, full disclosure here. 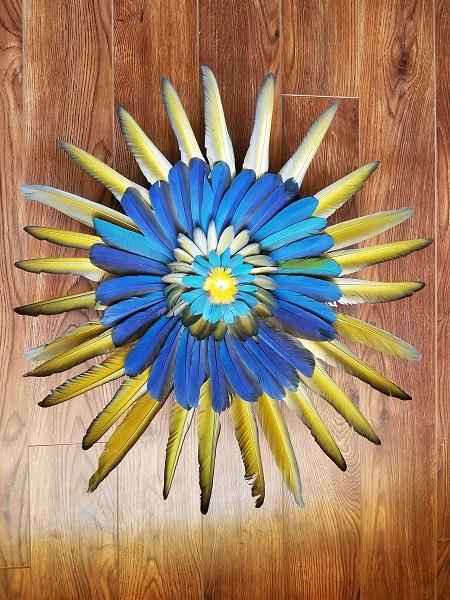 This feather wall art was made with naturally shed macaw feathers. 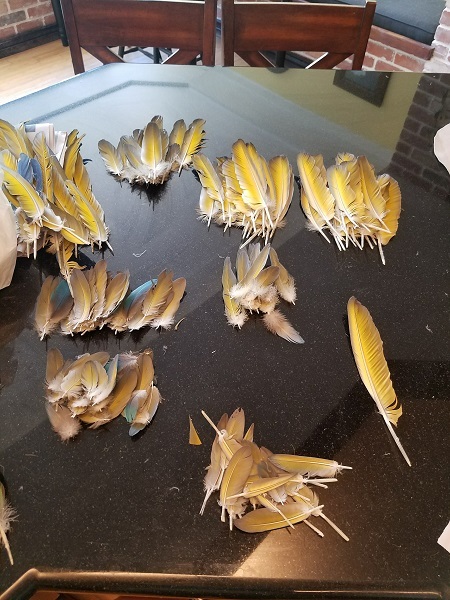 You see, birds usually shed their feathers every 6 months and as I’m sweeping the bird room, I collect a bunch of them and save them in plastic bags to preserve them. If you read my bio, you will see that I rescue and own quite a few exotic birds. From macaws to cockatoos, from Amazons to tiny little diamond doves. I got quite a few of these guys coming and going at all times. 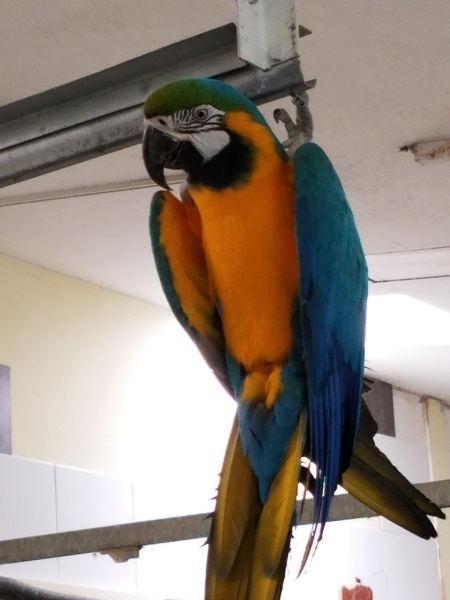 See Stuart, my Blue and Gold Macaw below. He likes to hang by his nails to keep an eye out for his girlfriend, Blueberry. We rehab them (some come to us really stressed out) and we find them forever homes. You can read my post about bird care and see how much is involved in caring for them. Anyway, the reason I’m telling you all this is that I want to let you know that these feathers were not purchased. You can purchase them online but they are super pricey. 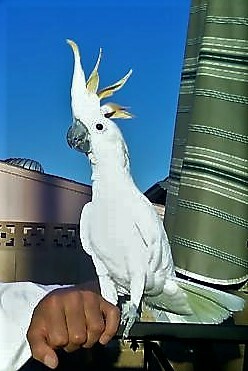 A tail set (about 10 feathers) can cost upwards of $100. You can use turkey feathers, duck, goose, and many other colorful birds feathers. Many will come from the “meat” industry where nothing gets wasted (not a happy thought but at least everything is being used). Also, many local farmers who raise egg laying chickens and ducks could hook you up too. Just use your creativity on the colors and I’m sure the result will be fabulous. A base: flat bottom wicker plate for a higher end finish (cardboard, or a plastic plate will work too). 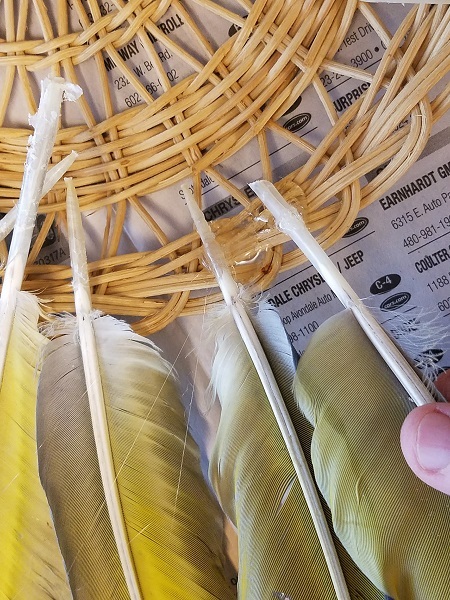 Before you start gluing the feathers onto the base, you need to separate the feathers based on sizes and colors (if you are using more than one). 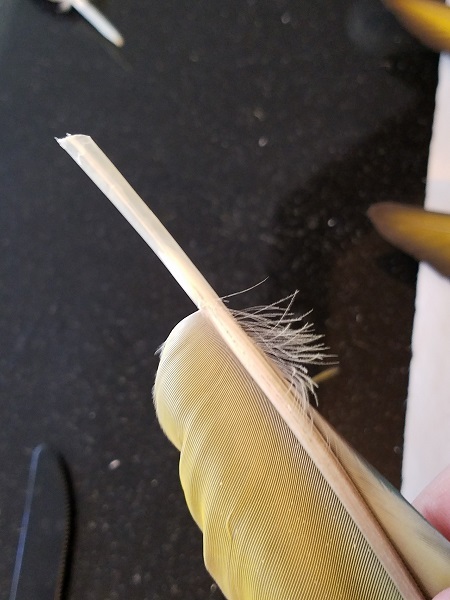 Feathers will have curvatures to the right and the left, so you want to make sure they are separated that way. It will make things quicker when you are gluing. Also, since sizes vary and in this project, we are working with several sizes, arrange them by sizes too. 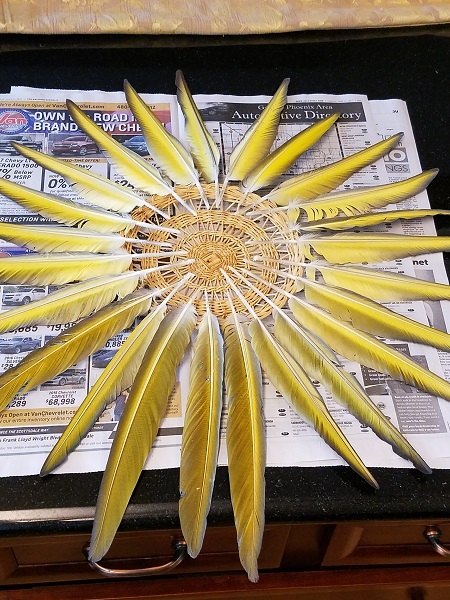 Once everything is organized, it is time to take a practice run on how the feathers are going to be placed around the base. You want to see how the spacing will work on the base and how many feathers you will need. Also, pay attention to the direction of the feathers. Use right curved feathers for the right and left curved for the left side. You want to start at the edge of the base and work your way in. Start with the larger feathers first for the outside rim. I started with the flight feathers. And since I wanted to give it a splash of color I flipped the feather on the other side. 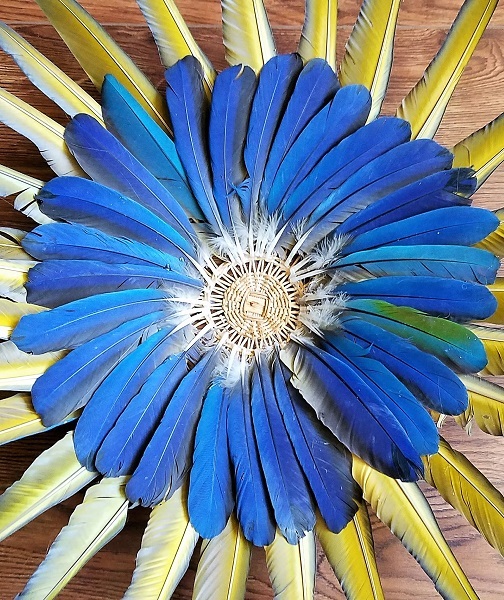 Macaw feathers are blue on the top and yellow underneath (mother nature is really cool, huh?). Before gluing, check if the size of the stem is too long, adjust as needed by cutting it with a pair of scissors. Then start gluing and adjusting the space between the feathers just like you practiced. Here is the finished first row. Notice the feathers are now blue (flipped to the outside) and of a smaller size. 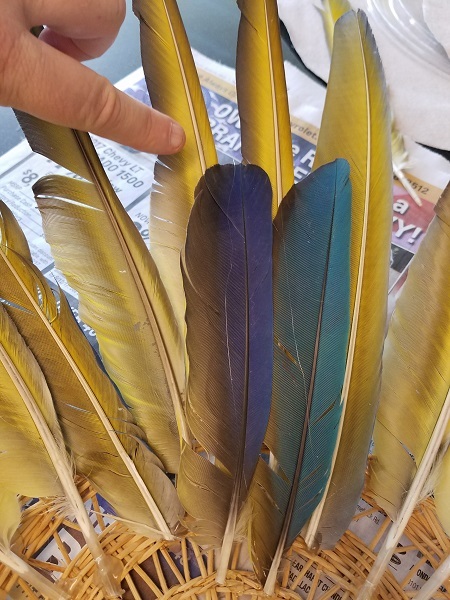 These are secondary feathers of a macaw wing (you know you are a bird owner when you know exactly where they come from. LOL). This is to ensure the feather won’t flop over when you hang it on the wall. Be sure not to press the top feather onto the drop of glue. Just let it rest over it. We don’t want the glue to seep through the feather. In the next row I wanted a yellow color, so once again I flipped the feather to its back and added smaller yellow feathers. 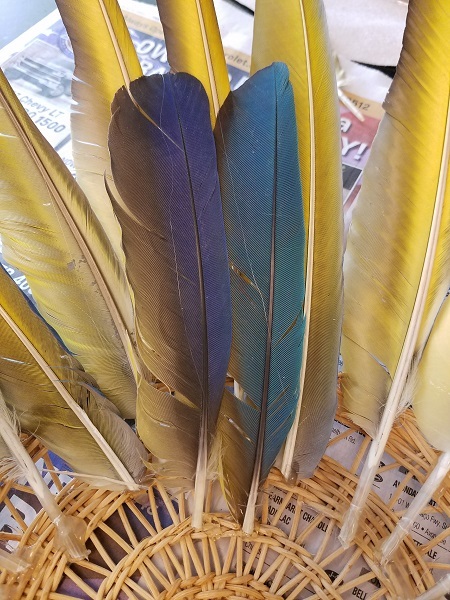 Once that was done, I added another row of blue ones and finished with yellow feathers. 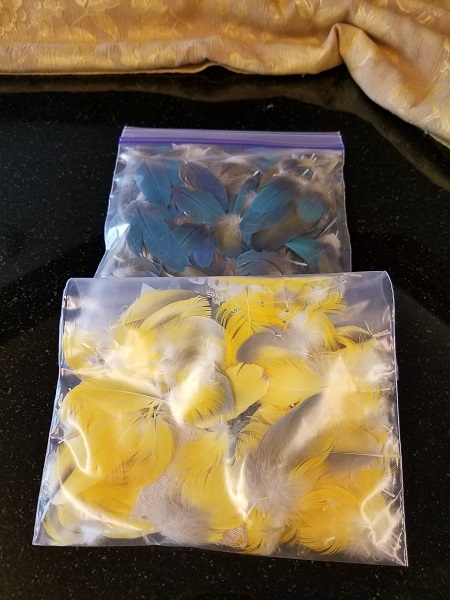 This time I used Blue and Gold Macaw chest feathers which are bright yellow (I forgot to take a picture of the next row, oops!). 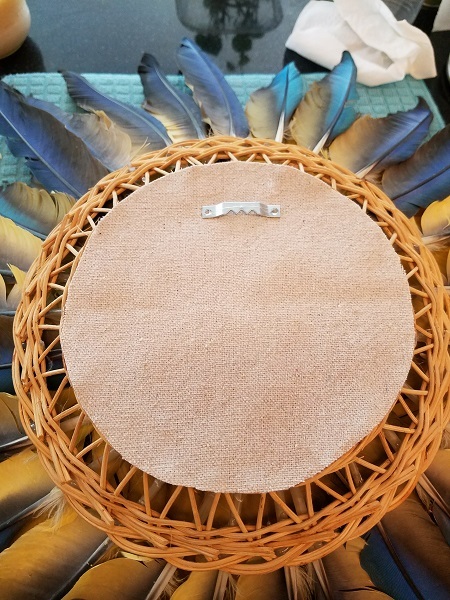 After cleaning up all the strings of glue, flip the entire project upside down and hot glue a circle of fabric cut to size to the back of your project to hide any imperfections. 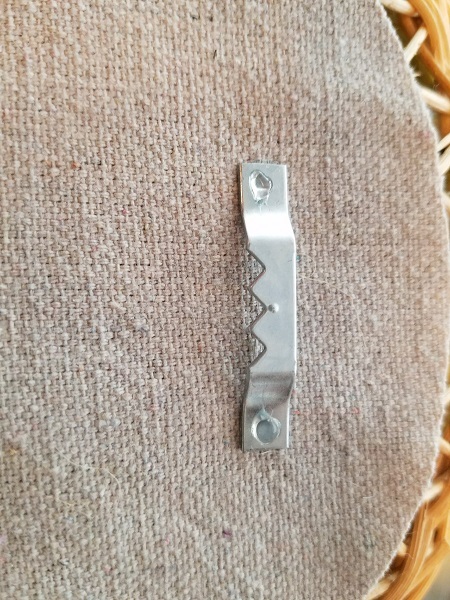 Hot glue the wall hanging bracket. Here it is with a white background. I love how the colors pop! 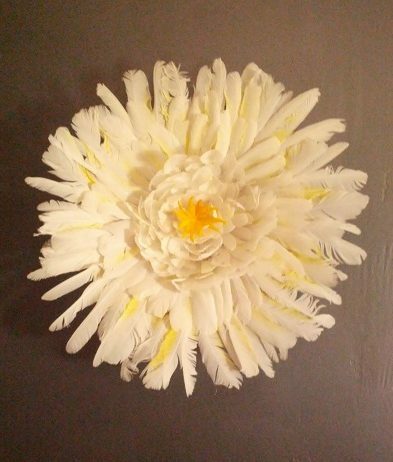 And here is another one of these feather wall arts with white cockatoo feathers. Coconut is a hoot and he says the funniest things like “Goodnight Sweetheart, see you in the morning”. 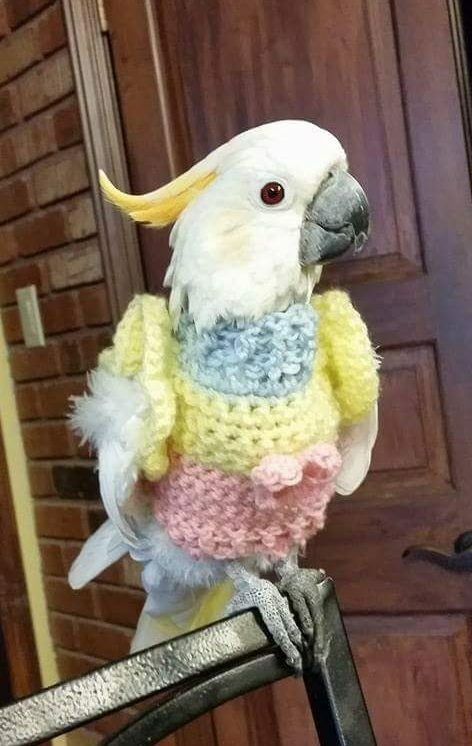 Cuddles is another one of my rescues and she wears fashionable sweaters because she is a mutilator (she will pull skin until she bleeds). The sweater prevents her from doing that and she loves it. She actually has a Facebook page too! 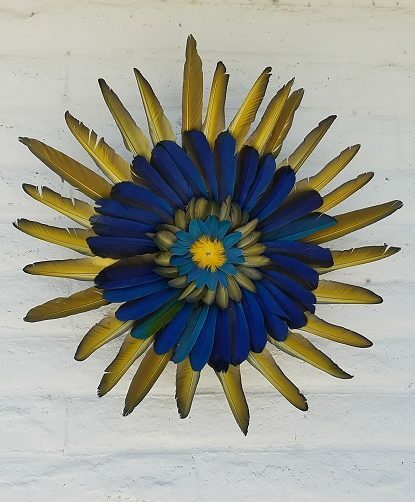 Finally, here is another one of my feather wall arts I created a while ago using a larger base. These feather wall arts look good anywhere around the house as a centerpiece in any decor. I have the white feather wall art in my bedroom right over the bed and the larger one on a wall right at the top of the stairs. 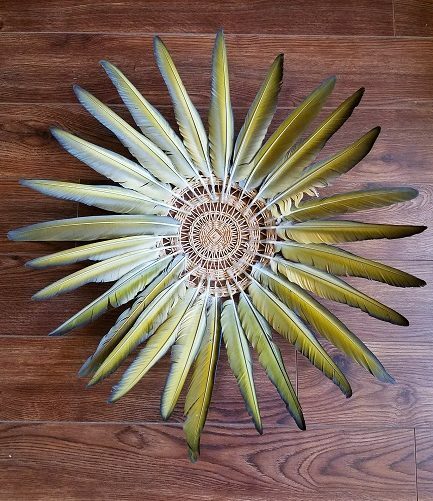 The feather wall art I created for this post is going for a good cause as a donation to The Oasis Sanctuary, a bird rescue organization in Arizona. If you wish to help them just click on the link above. They always need help. If you love these feather wall arts but you don’t think you are crafty enough, here are some ready made ones I found online. They are absolutely gorgeous! I hope you enjoyed this post. Follow us on Facebook and Pinterest for news and updates and sign up for our email list below to receive new posts right in your inbox. We are always creating new things to share with you.